Can Aquaculture Survive Without Forage Fish? Humans eat huge amounts of farmed fish. Farmed fish eat huge amounts of smaller fish. A new study explores this unsustainable cycle, and offers a path forward. Aquaculture is booming. Today, worldwide, we consume more farmed fish than wild-caught species. Think about it: How often do shoppers buy the more expensive wild-caught salmon over the farm-raised, and how often do they even get that choice? This global trend is taking a toll on the wild fish populations that are harvested to feed farmed fish. 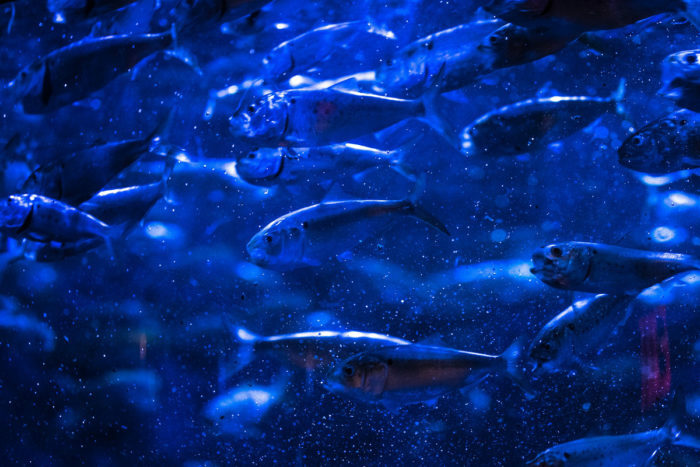 A new study in Nature Sustainability shows that, by 2037, aquaculture demands could outstrip supply of so-called forage fish, or fish like anchovies and menhaden, which are often deemed too small for humans to eat. Although they’re rarely considered by most consumers, these species do feed the fish we eat (and livestock—pigs and poultry are large consumers of fish-based feeds), making them a vital link in marine ecosystems. Despite the study’s dire conclusion, there is hope, say the authors. Feed reforms could allow for aquaculture’s continued growth as a source of critical protein on a hungry planet, while sustaining the forage species. Forage fish account for a whopping one-third of the seafood caught globally. These tiny wonders feed on plankton, the original source of nutrient-rich omega-3 fatty acids, bio-accumulating that nutrient and serving as a protein source for the vast marine food chain. Today, humans eat only about 5 percent of the forage fish we catch, in products such as canned sardines, anchovies, or fish oil pills. That number is down from the 15 percent globally we ate in 2000, partially due to the rise of aquaculture, which has made popular seafood such as salmon and shrimp more affordable for more people. The vast majority of forage fish gets ground into fishmeal and oil that are used to feed farmed seafood and land-based livestock. Aquaculture currently uses about 70 percent of the fish meal that’s produced globally. Up until the 2000s, however, the poultry and hog industries were the largest users of fish meal. Aquaculture’s fast growth—from some 15 million tons produced in 1990 to 80 million in 2016—has caused the price of fish meal to rise, and poultry and hog producers have begun to substitute it with cheaper protein sources like soy. But they still use 25 percent of fish meal globally. 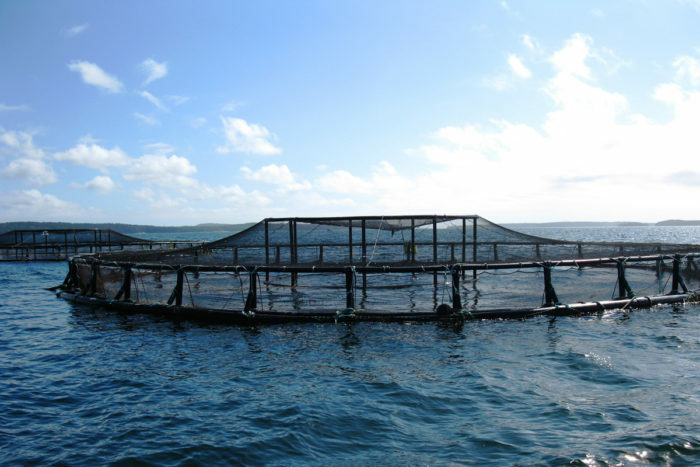 Economics are also driving the aquaculture industry to search for alternative feeds. “Ten years ago, when fish meal was inexpensive, it made up a large part of the diet. It was a perfect blend of the fishes’ nutrient needs. But now, you’re seeing diets that are blended from plant-based protein like soy, corn, canola, and pea proteins, and the percentage of fish meal is going down,” says Michael Rust, science advisor to NOAA’s Aquaculture Program, who was not involved in the study. Wheat and soy are the largest ingredient in fish feed today, according to Froehlich. Other shifts are occurring as well. The trimmings, (e.g., heads, tails, guts), from fish landed for human consumption are becoming an increasingly larger proportion of the fish meal fed to farmed fish, says Rust, who is optimistic that the market can help find creative ways to keep aquaculture growing. “The bottom line is that there are solutions,” he says. Around two-thirds of fish meal now includes trimmings, says Rust, who cites the Norwegian salmon industry, where the vast majority of the byproducts from the salmon go back into the fishmeal. “If you get to the point where your diet only contains 5 to 10 percent fish meal, that fish actually create all the fishmeal it needs for the next generation through trimmings,” he says. Froehlich’s research findings suggest that less fish byproducts are actually going into fishmeal worldwide. “China is a big question mark,” she says, because data were not available for its use of byproducts in fish meal. While Froehlich agrees that economics are driving down the use of forage fish in aquaculture feed, her model projects that, without rapid transition to more sustainable feed alternatives, the ecological limits of these small silvery fish could be surpassed in less than 20 years. Moreover, factors such as climate change could impact wild-caught fish population dynamics in ways that no one can predict. And conservation-based catch limits for forage fish could be tightened to leave more prey in the water for larger species, leaving less for aquaculture. Then there’s the omega-3 consumer craze, and the ever-growing preference for healthier, fish-based diets, not to mention the 2 billion more people who are projected to live on the planet by mid-century. Modeling different scenarios, Froehlich says her research found that forage fish populations could survive longer if we stop feeding them to “the things that don’t necessarily require it, like carp,” and that applies to poultry and pigs as well. 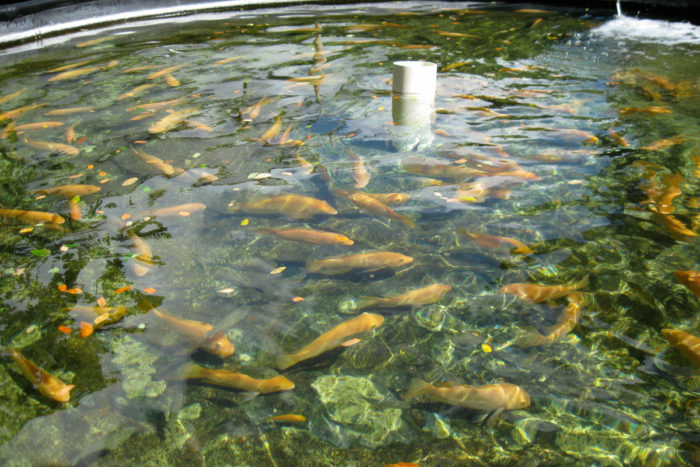 Feeding less fishmeal to carp and other fishes that are not carnivorous turns out to be the single best way to ensure the long-term sustainability of forage fish, according to Froelich’s research. Carp is the top farm-raised fish and is mostly cultivated in Southeast Asia. While carp feed typically contains a tiny fraction of fishmeal, the sheer volume of the fish that is produced makes it the single largest user of forage fish in the aquaculture industry. Some companies are innovating alternative feeds for carp, spurred in part by the Future of Fish Feed (F3), a collaborative global effort among NGOs, researchers, and companies that holds worldwide competitions to innovate seafood-free feeds. Chinese company Guangdong Evergreen Feed Industry Co. won the first challenge last year, and earned $200,000 by becoming the first company to produce and sell 100,000 metric tons of seafood-free feed. Such feeds can include ingredients like fly larvae, algae, and bacteria and yeasts. Single-celled bacteria and yeasts can also be easier for fish to digest than soy-based feeds, according to Michael Tlusty, an associate professor of Sustainability and Food Solutions at the University of Massachusetts Boston, and one of the challenge’s judges. 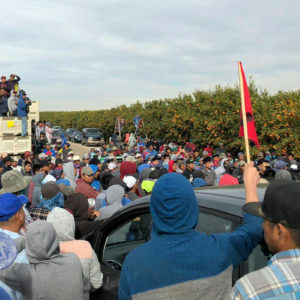 F3 is in the midst of a new challenge to spur production of an alternative oil, not made from fish, that is rich with omega-3 fatty acids, an essential ingredient in fishes’ diets. Oils will globally be the more limiting factor in developing alternative feeds, according to Tlusty. 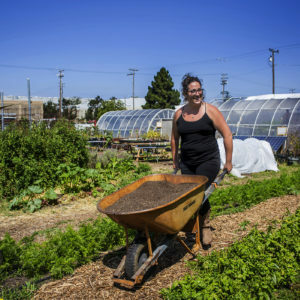 Some of these alternatives may involve genetic modification of yeasts or bacteria, which are also a cause for concern among some advocates and consumers who want to avoid GMO products and byproducts. Beyond changing what carp eat, the second-best solution researchers found was to stop feeding fishmeal to piglets. Froehlich says, “it doesn’t look like there’s any big push in the pig or poultry sector to reduce fishmeal other than the cost factor.” But she thinks that feed companies, such as Cargill, could be a good leverage point for making this shift. Another proposed solution is to eliminate farmed fish entirely, with some advocating for eating forage fish directly, and recent research estimating that 90 percent could be directly eaten by humans. 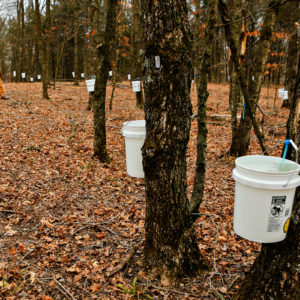 That alone is not a viable solution, however, say the study’s authors. In addition to the significant hurdle of changing consumers’ fish-eating habits, the authors point out that much of the current use of forage fish is driven by policies and processes that favor reducing these fish to meal and oil. 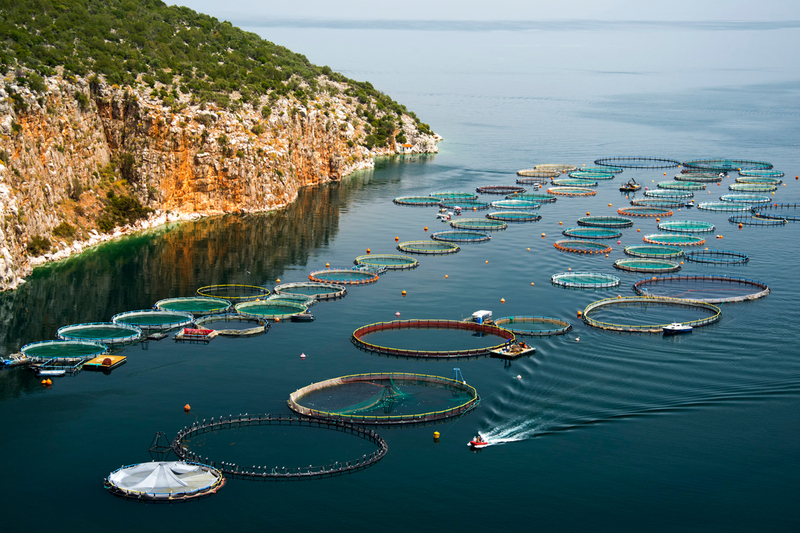 The aquaculture industry will have to find solutions for these challenges as well, if it is to continue on its current growth trajectory, and serve as a sustainable food option on a finite planet with a fast-growing population.